After you’ve taken the time to find all the leaks in your home you have to get rid of the leaks to make a difference. In most cases this is as simple as sealing the leaks using caulking, weather stripping or spray foam insulation. I typically recommend starting with your ceiling and then working your way down. 1. Recessed lights: In most newer construction homes, recessed lights will be at least insulation-contact approved, but some may be ICAT- or insulation-contact air tight. This means that they don’t allow air to leak. One of the problems with recessed lights is that they may be ICAT rated, but the wrong trim kit installed. Most of the time, if your light is leaking, you can replace the $5 trim kit with an airtight one, and it makes a huge difference. If this is not the case, you can either replace the light with an ICAT or install a preformed cover that creates an airtight seal around the light. These covers can be ordered typically from the same Websites that sell battic covers. 3. Bathroom Vents and Lights: The leaks at these typically occur due to a gap between the boxes and the drywall. You can simply caulk or foam the gap. Bathroom vents can leak at the duct. In newer models, this is reduced with a damper that opens and closes with operation. This damper can get stuck or may not seal completely. If you don’t have the damper, you can replace the fan with a newer model, or you can install a damper at the end of the duct where it exits the home. 4. 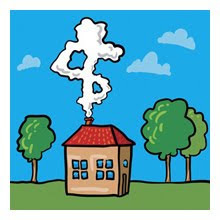 Chimney Chases: Chimney chases often go from the first floor all the way to the attic without being sealed. While it is not advisable to insulate around the chimney due to fire hazards you can seal off the top of the chase using metal and fire caulk. 1. Doors and Windows: Most of the leaks in the walls will occur at either the doors or windows. This can be corrected with weatherstripping and a few other techniques. Due to the various ways to correct, I will address how to correct these leaks in a separate article. 2. Plumbing: These leaks are simple to correct. They will typically occur at gaps between the pipes and drywall. You can correct this by caulking or foaming the gap depending on the size. 3. Electrical Outlets: These only account for 2% for your total leakage, so I typically say not to worry about them at first, but they are an easy to fix. Special gaskets can be installed behind the cover. To get a full seal, you have to use safety covers to seal the outlet holes. 4. Duct boots: Ducts will get their own article, but the boots fall under the envelope. The boots are the metal items that you see coming through the floor or ceiling (yes, these can also fall under the ceiling section). Since the leak is occurring due to the gap between the boot and the floor/ceiling, these leaks are not really in the ducts themselves. To fix this leak, you can either caulk, use foil tape, or mastic the gap. The basement will have a lot of the same leaks as the home, so you can follow a lot of the same steps as above. Also, if the insulation is on the basement ceiling, you may want to treat it more like a crawlspace. My advice is to seal the basement as if you were going to finish it, but time and money may dictate otherwise. 1. Rim Joists: If your rim joists are not insulated, you can seal and insulate them using spray foam. The amount of foam required is more than the standard can foam is capable of handling, but canister kits are available for large jobs. Rim joists in the crawlspace are typically going to have insulation in contact with them, and you can sill penetrations in the floor so sealing these may not be as high a priority in that situation. 2. Foundation Penetrations: These are easy to see and can be corrected by filling the gaps with spray foam. Again, depending on the construction, these may not be as important for air sealing when in the crawlspace. However, they should be sealed to help prevent pests from entering the crawlspace. 3. Floor penetrations: In the crawlspace, these may be a little harder to find (due to the insulation), but all electrical, plumbing, and HVAC penetrations should be sealed using fire caulk or spray foam, depending on the size of the gap. You may have already sealed a few of the gaps from the inside, but it still helps to seal from this side, also. Most of these gaps are going into wall cavities. The air in the cavities can find more than one exit, so stopping the source of the air helps tremendously. While this energy tip may not relate to electricity or gas, it relates to another resource that can be overlooked. It can also save you money if you pay for your water! 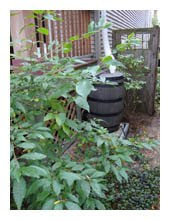 Use rain barrels to collect water from your roof or other collection systems, and use this water to water you plants and yard. Barrels can be purchased or constructed.